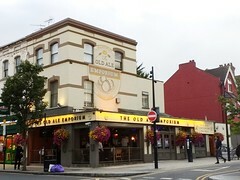 Pub in Harringay, located on the corner of Burgoyne Road and Green Lanes. It became a free house in August 2007 and proudly proclaimed itself as "biker friendly". It then underwent renovation around the end of 2008, and became much neater and smarter than its old, slightly scruffy, incarnation. According to Harringay Online, there was another change of management in late 2013; we haven't done a full survey since, so some of the details below (e.g. about accessibility) may be out of date. There's a comfortable covered patio out the front for the smokers, and the interior has varnished wood panelling and exposed floorboards. The small room at the back has bookshelves filled with books. Kake first visited on a Tuesday lunchtime in June 2008. Summer Lightning (£2.80/pint) and Quick Fix were on as guest ales; Adnams Broadside was available too, and the Pride clip was turned around to indicate it was off. The TV was showing a music channel (sadly including adverts). There were several regulars clustered around the bar, and a few other people came in and out while I was there; everyone seemed to know each other. Kake visited again on a Monday afternoon in September 2009. This time there were two ales on; St Austell Tribute (£1.40/half) and London Pride. When I arrived around 3:30pm there were about 15 people in, split between the inside and the outside. A flatscreen TV was showing Sky Sports News with the sound on. Steev visited on a Monday afternoon (around 4pm) in August 2016. There were four ales on: Caledonian Road to Rio, Speckled Hen, Moles Jailers Daughter, and one other. On keg, they had Strongbow, Symonds cider, and probably four or five lagers plus Guinness. Two halves of ale (both at £1.70) were reasonably well kept. There were roughly six people inside, and six outside; all noisy, and probably half-cut. The jukebox went from cheesy Euro disco pap to "Being Boiled" by the Human League. If the group inside knew the song, they'd sing it. Loudly. There were lots of signs about food allergies, but no sign of food. There's a free jukebox on Saturday from 8 til 1, and sport showing throughout. The dartboard has an electronic scoring unit. Accessibility: A wide ramp at the front gives step-free access from the street, but there's a step up to get to the back room and the toilets. Last visited by Steev, August 2016. Opening times taken from sign in window, June 2008. Last edited 2017-11-02 17:50:50 (version 12; diff). List all versions. Page last edited 2017-11-02 17:50:50 (version 12).